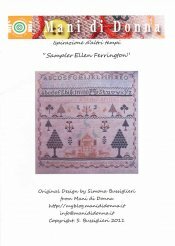 Sampler Ellen Ferrington [C5649] - $17.00 : Yarn Tree, Your wholesale source for cross stitch supplies. Cross Stitch pattern from Mani di Donna. This sampler features the alphabet stitched at the top of the design, in a couple of different colors. Below the alphabet, trees, flowers, birds, etc. are stitched. Stitch count is 164W x 226H.